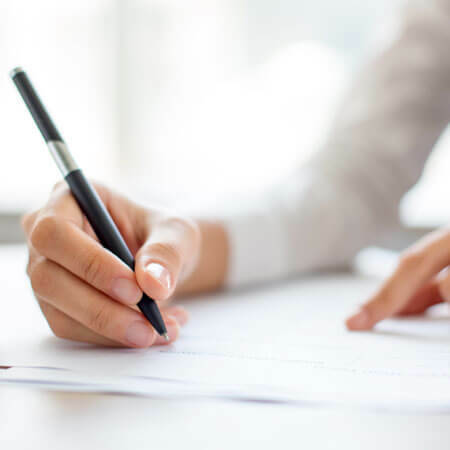 Appointment request letter is a formal letter one creates to request a meeting, one on one time for discussion or perhaps a meeting to see a doctor a lawyer or other busy business entity. Possibly a political leader to make sure that they have time to meet you in their hectic schedule. This is done to secure their time in a polite manner that shows the seriousness of the request. When to Send an Appointment Request Letter? There are numerous situations that call for an appointment request letter. Luckily there are many options for anyone unfamiliar with how to write such a document. Using sample letters will save you time and keep it brief, concise, and to the point. Samples are like training wheels for preparing a person to create their own. 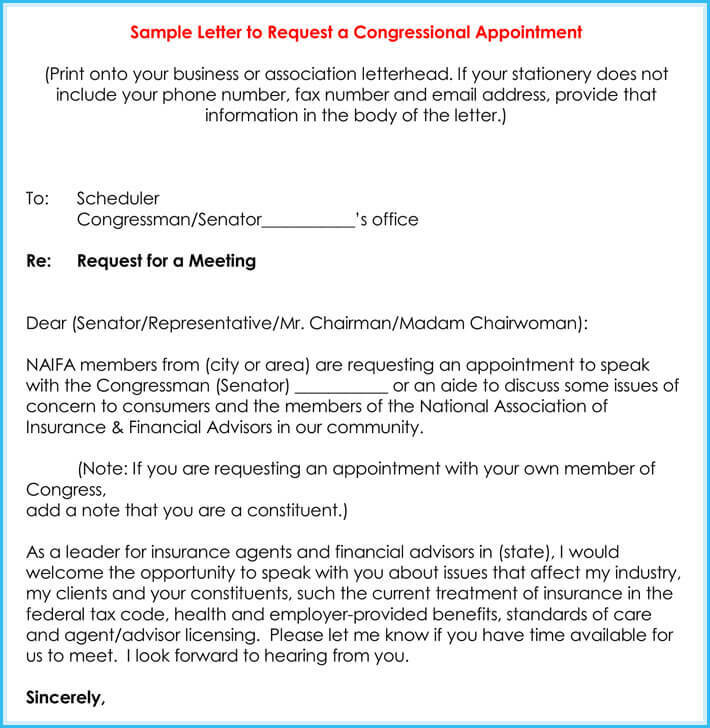 The type of situation that requires an appointment request letter can be one’s desire to speak with their senator or other political representative. A second type may be the need to speak with someone’s doctor or attorney. Another situation would be someone needing an appointment with a busy boss or supervisor. A final example situation is the appointment one wants with a job interviewer to discuss a position for work. I am writing to request for an appointment with you on (date) at (time) in (place). I am a member of Human Right Champions (HMC) in (your town or city) and I would like to discuss your responsibilities Senator of (city) and the way you may contribute to championing for human rights in (state). (Name and job title) will also be attending the meeting. You may come along with other members of the Senate, friends, or representatives to the meeting. I realize that you are a busy person and I would like you to please confirm that you will attend the meeting between (time) and (time). For more information contact me at (phone number) or email at (email address). I will call your office line before (date) to confirm the details of the meeting. Thank you for considering my request to meet and I am looking forward to hearing from you. I am writing this letter to meet with you on October 22nd, 2018 at 8.00 am. According to the current health dynamics in Africa, my team suggested that I contact you to discuss the measures to put in place to control the spread of diseases. Being the WHO representative in Africa I assume that you are aware of the health challenges the people in your continent are facing. My hope is to obtain in-depth information about the disease situation in your continent for us to come up with strategic ways to combat them. I will be in Nairobi, Kenya from 15th to 26th October, attending the World’s AIDS day conference and I hope you will be available to meet with me. Thank you so much for considering meeting with me. I will call your office to confirm the meeting place. For more information you can contact me at + 4447897707 or blue5@gmail.com. I am looking forward to hearing form you. I am (name) the (title) of (company) and since you are one of our loyal clients I would like to thank you by inviting you to 50th anniversary as a successful organization which will be held on (date) from (time) at (place). I would like you to celebrate our success with us on (date). We are looking forward to meeting with you. Thank you for considering meeting with our team on (date). I am the sales director of Toyota Company. I met you for a short time during the worldwide motor vehicle conference last month and I am writing to request a meeting appointment with one of our representatives on 17th October this year. Kelly Bush one of our sales representatives is going to be in Florida between 14th and 24th October and we request that you meet with him on 17th as that is the only day he will be available. The meeting will last for about one hour sometime between 8 am – 2 pm. 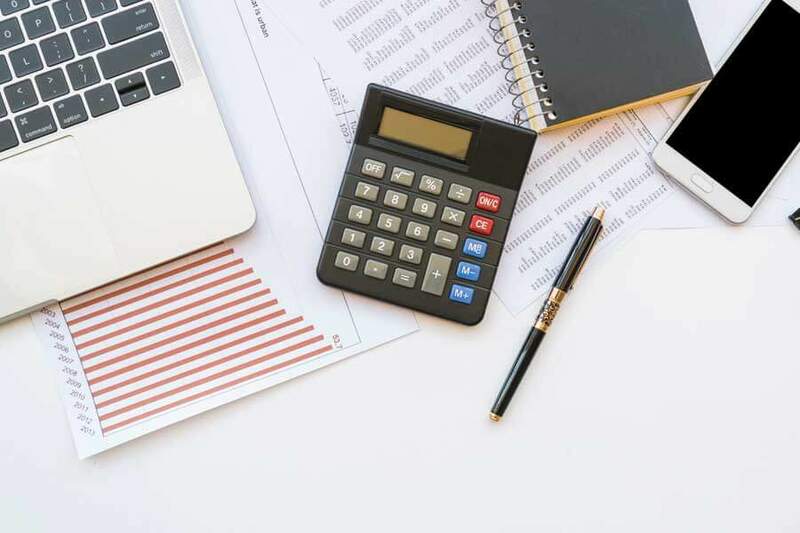 Kelly has performed a thorough research about your business contract and he would like to discuss with you the benefits you would obtain by trading with us. For more information please contact me at +14444000005 or by email at smith@gmail.com. I will contact your office before 17th to confirm the details of the meeting. I would also like you to confirm if it will be possible for you or your representative to meet Kelly on 17th in Florida. Thank you so much for considering meeting with our sales representative. We are looking forward to hearing from you. If your schedule permits, I would like to schedule a meeting appointment with you at your earliest convenience. I am interested in discussing my progress at this company as well as some other relevant and urgent issues. Would this Monday at 3 PM work for you? If not, please let me know when would suit your schedule best. I very much appreciate you taking the time. I am writing to request a meeting appointment with you at your earliest convenience. I would like to discuss (insert issues here). I know you are very busy, but I would very much appreciate you taking the time to meet with me. Are you available at (insert time here)? If not, please let me know when would be a good time for you. I appreciate you making some space in your busy schedule for me. I am writing this letter to request an appointment with you regarding some health concerns I have been struggling with recently. In particular, I have been struggling with frequent dizziness and chest pains, and your services have been recommended to me by my colleagues. I have consulted with my regular physician regarding these symptoms, but since you specialize in cardiovascular issues, I wanted to consult with you to get a second opinion. If you have the time, I would really appreciate a consultation with you to get your professional opinion on my symptoms. I know you are very busy, but if you are available to schedule an appointment with me, I would be very grateful. I am writing this letter to request an appointment with your office regarding some concerning health problems I have recently been experiencing. I have been struggling with (insert symptoms here), and you came highly recommended by (insert reference here). While I have consulted with my primary care doctor about these symptoms, it is still very important to me to get a second opinion about this potentially serious problem. I know you are incredibly busy, but since you specialize in these issues, I would like to consult with you regarding my symptoms. If you have the time, I would very much appreciate your office scheduling an appointment with me. I am writing a letter to request for a position (post) in (company). As duly advertised in (site) dated (date) I would like you to consider me as (post) in your organization. I graduated from (college) with (qualification) in (course) on (date and year). I have been working at (organization) as a (post) for the past (number of years or months). Given the chance, I will apply my skills to improve the growth of your firm. Having checked your qualification demands, I believe I am qualified for the post. I am looking forward to hearing from you. Thank you so much for your time. My name is Jane Ray and I am writing this letter to request for a position as a sales representative at Nivea Limited. Following your advertisement in New York Times dated 23rd October 2018 for a job vacancy in the sales distribution sector, I would like you to consider me for the post. I am a former student of Harvard University who graduated in 2015 with of Master’s Degree in business management. I have been working for Crystal Automobiles for the past two years. I have attached my Curriculum Vitae, certificates and other necessary documents for your consideration. I consider that an opportunity of meeting with you would be good as I am thrilled to join your firm. During the meeting appointment, I will be able to explain my interest and personality. I will be privileged to work as a sales representative for your company. I am looking forward to meeting you. I work as Director of Sales for ABC Corporation, and we’ve met at several industry networking events. One of our sales representatives will be traveling to your area during the last week of June, and we’re very interested in scheduling an hour-long meeting with you on any of those days. We’ve been following your business and have a sales proposition that we believe would be mutually beneficial that we’d like to present to you. Are you or one of your associates available for such a meeting? I will be in touch over the next few days to follow up and set up a time that’s convenient for you. Please don’t hesitate to ask if you have any questions. I work at (company) as (title), and we’ve met at (insert details here). 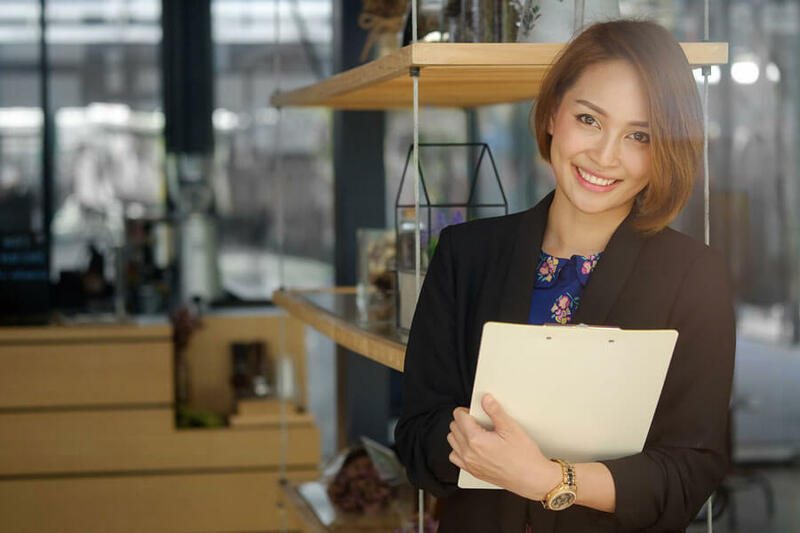 One of our associates will be visiting (insert city here) on (insert dates here), and we’d love to schedule a meeting with you to discuss a mutually beneficial sales proposition. We’ve been researching your business and we believe our services would be a good fit for you. Are you or someone from your organization available for a meeting? We will follow up shortly to discuss potential dates and times and address any questions you may have. 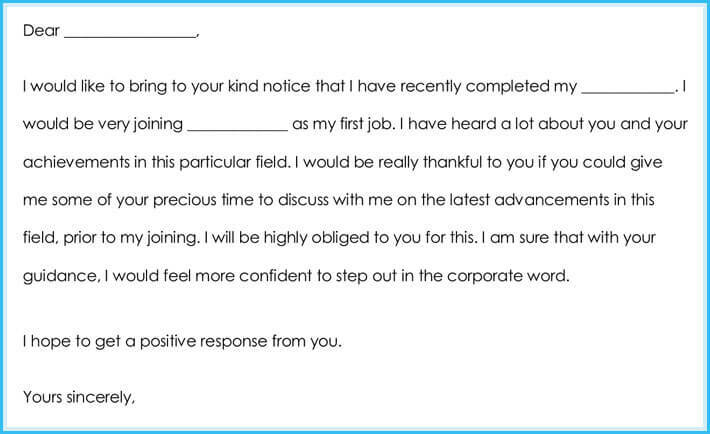 This sample letter is the response of a business organization to a request by another company to do a particular task for them. The business company replying in the context, received the news from a former client. The business is now expressing interest in the offer and are requesting for a meeting to discuss further on the details. The business in question is already established and has a catalogue of products that they deal with. The company interested in their services wants to hire the business organization to do a specific task for them. They learned of the business through a third party who is the former client of the business organization. Information about the business such as the address and contact is provided. This sample letter is a request for a meeting or appointment with a member of congress. In this context, the request is coming from the head of an insurance organization. The leader starts by stating that they request an appointment with the Congressman or a representative of the Congressman. The reason for the appointment is stated in the second statement of the letter. A further description of the sender can be added before giving more details about the and the purpose of the appointment. The details of the appointment are provided clearly and briefly. The letter is short and comprehensive. It has just enough information to clearly describe the issue at hand expressing its importance. 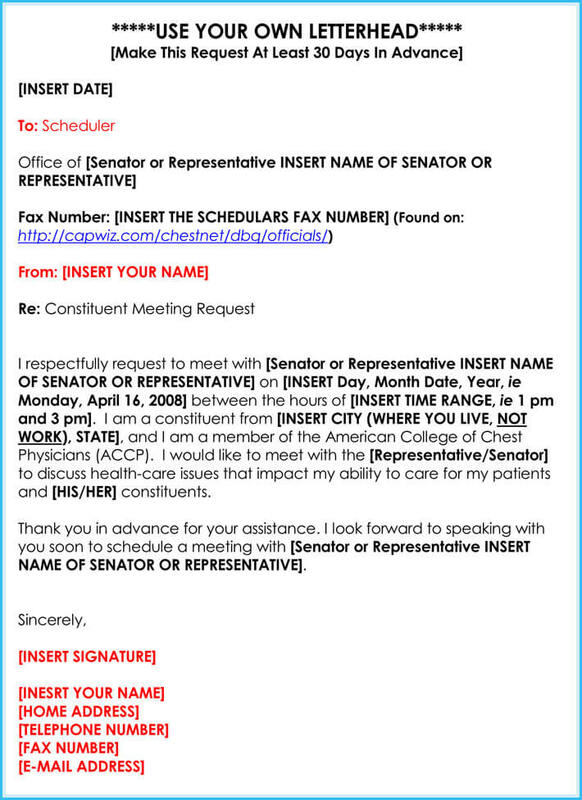 In this sample letter the sender is requesting for a meeting with the congressman to discuss healthcare issues. The sender in this case is a member of the American College of Chest Physicians. The purpose of the letter is declared in the first sentence of the body of the letter. Here the name of the specific Congressman or representative is mentioned together with the date and time that the sender is willing to meet with the recipient. More details about the sender such as their state and occupation are provided. The next part is to describe the purpose of the intended meeting. In our case, the physician would want to discuss about the wellbeing of his or her patients and how to improve his ability to care for his patients. After this more information on how to contact the sender is provided. 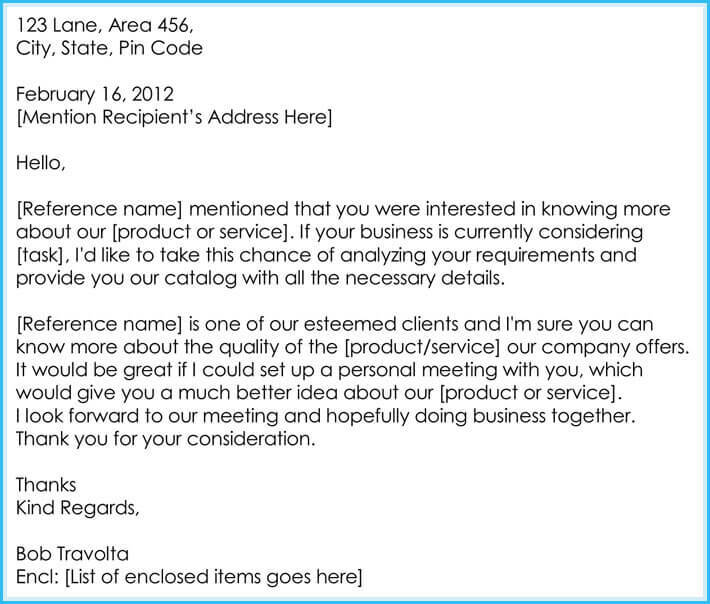 This sample letter simulates a situation where an organization would like to request an appointment with a company. 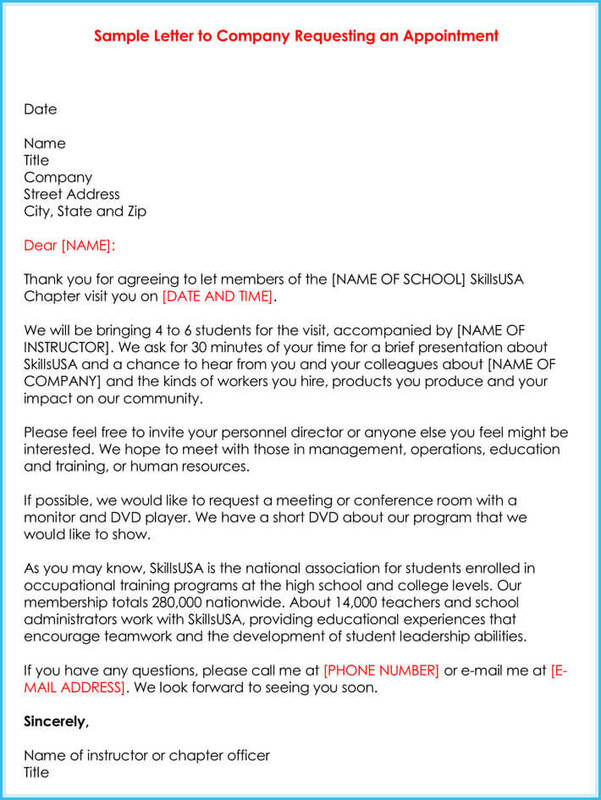 The letter describes an organization named Skills USA which has members in various institutions. Here the members of the organization in a particular school would like to visit a company. In the letter the company has already accepted the request for the visit and the organization is expressing gratitude. They also give more details about their visit. The number of students, accompanying staff, equipment they will require, their intended audience and the materials they will bring with them. After that they provide more information on their organization and their purpose for the appointment. This sample letter is a doctor’s appointment letter request. It is written in a friendlier tone with the patient explaining his or her personal problems to the doctor. There is no sender information provided in the letter assuming that the doctor is already familiar with the sender. The sender starts by stating the purpose of the letter. Here the sender has been suffering from chest pains and is not satisfied with the treatment he has been receiving. He and his regular physician have both agreed that it is better to get the opinion of another professional. 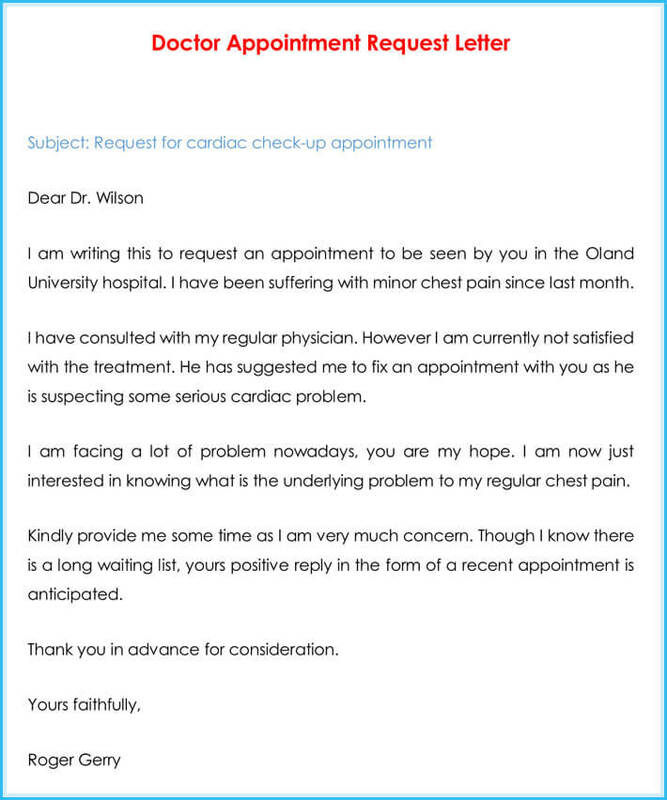 The sender explains his symptoms in the letter and explains his concern. He acknowledges that the doctor is busy and thanks him for his time. This sample is a general appointment request letter. It has no information about the sender. The letter does not start by stating the purpose right away. It starts with explaining that there are meetings undergoing in various states that have more or less the same purpose as the one the physician is requesting. The physician then expresses the purpose of the meeting and starts explaining the details of the agendas to be discussed. 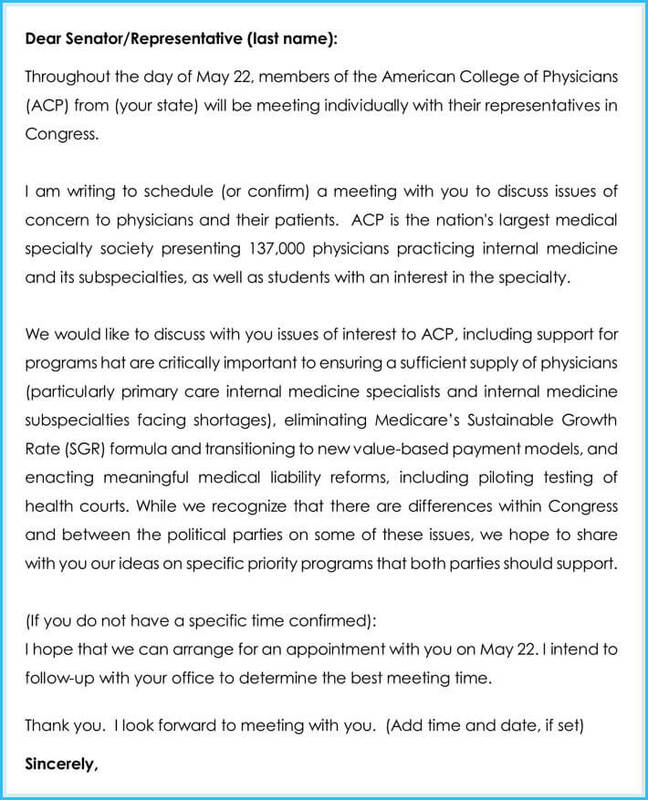 The physician who is a member of the American College of Physicians gives a detailed description of what he or she wants to discuss during the meeting. This sample is quite long in comparison to others. This is because of the many agendas specified by the physician. In the end the physician proposes a meeting time and date. This sample letter is a request for a job appointment. Here the sender has just left the learning institution and is looking for his or her first job. This job is to be the stepping stone to starting a professional career. It is short and to the point. The sender expresses interest in the company he or she wants to work for. No qualifications have been mentioned and the sender clearly asks for the company’s guidance as the sender starts learning how to survive in corporate world. The sender requests time from the company to discuss what his or her field of expertise entails. No information about the sender or receiver is provided in the letter. It is short and to the point. It has a friendlier tone and looks less official. 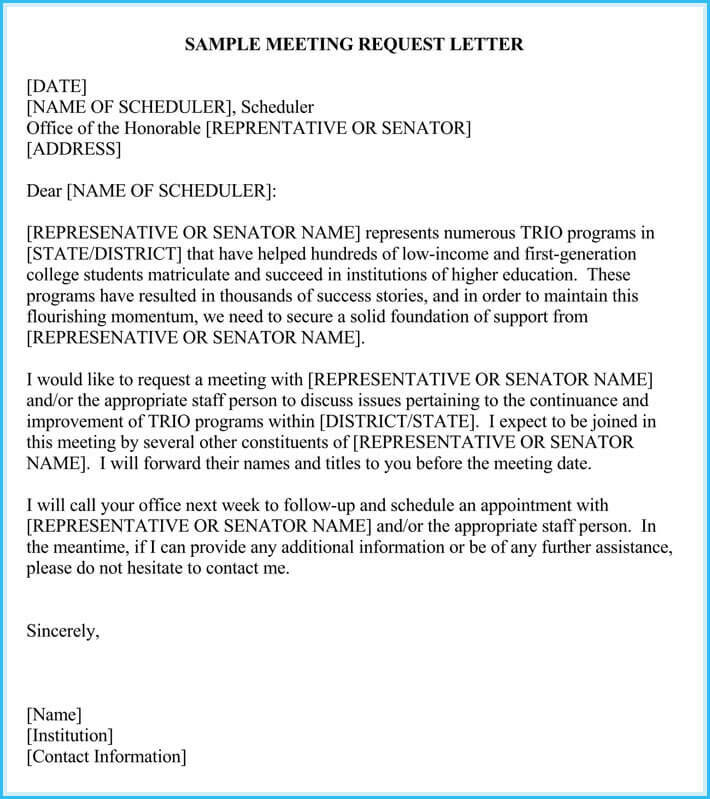 The last sample represents an office situation where the sender would want to schedule a meeting to discuss the continuance of a program that has been going on. Some information is added to the letter such as; date, scheduler, office of sender and address. The letter has a more professional feel. It starts with praising the TRIO programs that are taking place in the district and how well they have been performing. The sender then states that the purpose of the meeting is to ensure the continuance of these programs. The letter also states the expected audience and the caller of the meeting. At the end of the letter there is some additional information about the sender including contact information. Using a proper format – ensure you write your letter in a professional format. You should include the following information in the top left corner first, contact’s full name second, title, third company name, forth company’s address, and fifth, the date. Leave a single line space between the address and date. You may add a subject but this is optional. Start with a salutation – begin your letter with a proper salutation. If you know the person you are writing the letter to you can use their first name, for example, “Dear Lucy.” Otherwise use the individual’s last name and the actual title such as Mr., Mrs., Dr., or, Ms. If the recipient is unknown use salutation like To Whom It May Concern, Dear Madam, or Dear Sir. 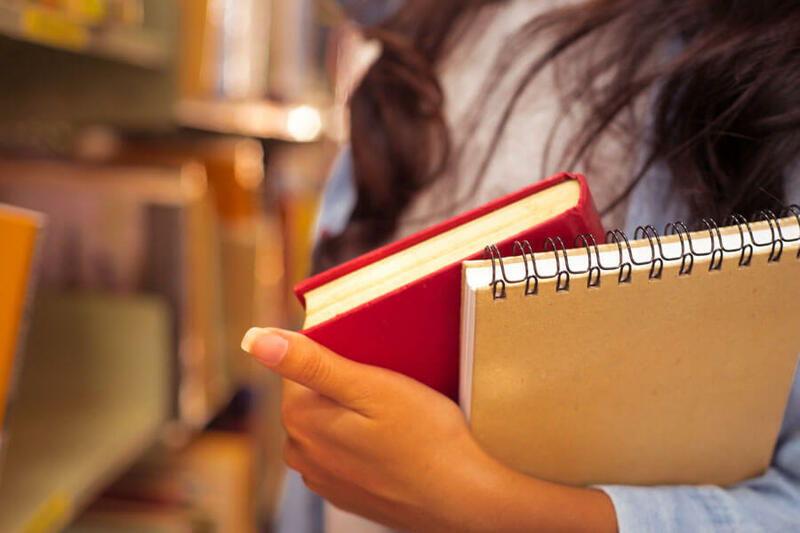 Write a body paragraph – the body paragraph includes the context, information, and other specific details concerning your request. In this paragraph, you can describe your request giving reasons as to why your request should be considered. Make sure you are thorough but as brief as possible. You should present your request in a specific and straightforward manner. For example “I would like to respectfully request for an appointment with you to discuss the events of the summit.” You should also be factual and courteous. The tone used must be appropriate for the recipient. Include a concluding paragraph – in this paragraph, you should express your gratitude to the recipient for his or her consideration of your request. You should also state the time constraints you are facing. 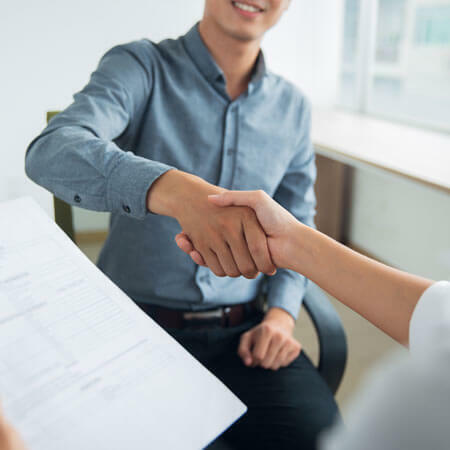 For example, when requesting to meet with someone before a certain time or date include it in the conclusion and ensure that it is clear and presented in a polite manner. Closing – a polite and appropriate closing is required. For example, you can use sign-off such as “Sincerely,” “Best regards,” or “Respectfully,” followed by your full name. Skip two lines at the end of the letter and add the closing. Leave four line spaces between the closing and the name for your signature. 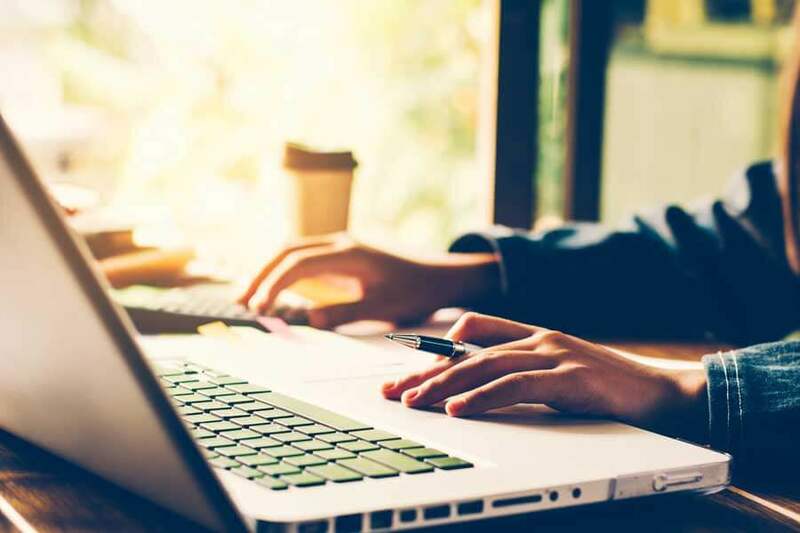 When writing an appointment request letter it is in your best interest to include the most important points such as why an appointment is needed, how much time is needed, and one should include any pertinent information to be discussed. This is why examples of appointment request letters are so helpful. The templates let you add your own details while not letting one leave out the formalities of a professional letter. Again, sample templates also help teach one how to create an original that is as professional as well.